Good morning! Meal Prep Monday time for you! 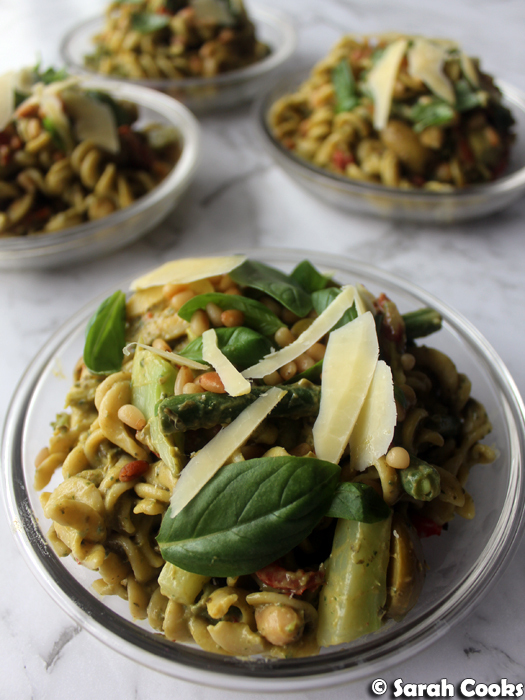 Today's meal prep is a boldly-flavoured and wholesome vegetarian pasta salad, with a creamy avocado pesto dressing. It's basically all the flavours of the deli, in one easy-to-eat meal that can be spooned straight into your mouth at your desk. Inspiration for this meal prep: a new cafe that opened up near my work, selling a huge range of all the basic Aussie breakfast and lunch takeaway items: salads, baguettes, wraps, sandwiches, soups, juices, soft drinks, coffees, banana bread, and other sweet treats. They've only been open a few months, and they seem to be crazy popular. I sometimes buy sandwiches from there when I'm in a rush, but they also have a huge salad bar, and the pasta salads always look and smell so good! Other inspiration: a half jar of basil pesto sitting forlornly in my fridge, and a packet of gluten-free, high protein, high fibre chickpea pasta spirals that I bought on a whim. And avocados. Always avocados. For the dressing, I combined the flavour of pesto with the all-around creamy goodness of avocado - I just whizzed together some store-bought basil pesto and half a very ripe avocado, and then adjusted the flavour and texture with lemon juice, olive oil, salt and pepper. I also threw some fresh basil leaves in there because I had them, and because - gasp! - it was a pretty cheap, homebrand jar of pesto, and I wanted to bring it back to life. There's lots of goodies in the pasta salad itself, and I tried to pack extra vegetables and protein in there. We've got cooked broccoli (use whatever green vegetable you like), and a bunch of things I bought at the deli (sun dried tomatoes, roast capsicum, olives), because once I had pesto on the brain, I totally started craving those strongly flavoured deli foods! 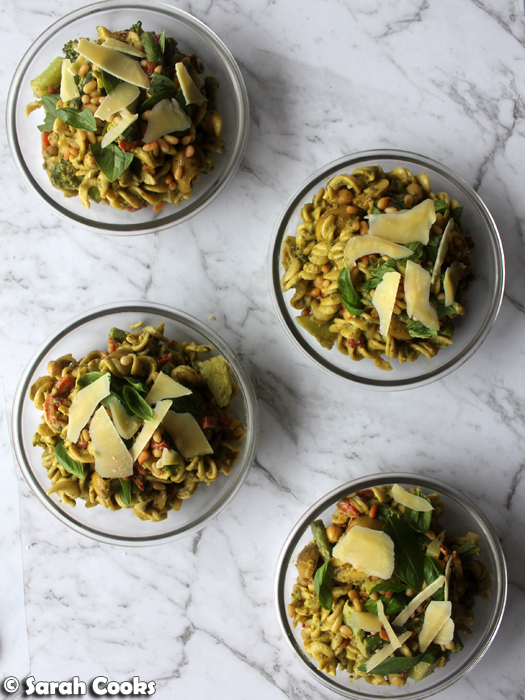 Plus a mini tin of chickpeas (extra protein and texture, and I felt it fit in with the "chickpea pasta" theme), pine nuts (no reason needed), and a little parmesan on top. And that's it! It was quick and easy to make, mega comforting and super tasty! I'd recommend using whatever pasta you like. An Italian friend of mine saw the chickpea pasta in my pantry and threatened to disown me, heh, but I thought it was perfectly fine for this application. And besides, it's a pasta salad with avocado in it - I'm clearly not going for authentic Italian cuisine here! You could also mix up the vegetables (asparagus or green beans might be nice), add slices of grilled or poached chicken breast if you want extra protein, add some salami (no redeeming health features there; I just really like salami and it fits with the deli flavours), or veganise it by skipping the parmesan and using vegan pesto and an eggless pasta. But I thought it was pretty great just the way it was. I hope you enjoy it too! Toast the pine nuts in a dry frying pan until light golden brown and fragrant. Set aside. Cook the pasta according to packet instructions. 2 minutes before the time is up, add the broccoli florets to the pan of boiling water so they can cook too. Drain the pasta and broccoli and set aside in a large mixing bowl. Drizzle with a little olive oil so it doesn't stick together. Add the chickpeas, roast capsicum, green olives and sun dried tomatoes to the pasta. Add most of the pine nuts, leaving a few teaspoons for decoration. To make the dressing, place the basil pesto, avocado, and lemon juice in the bowl of a small food processor and whizz to combine. Taste and add extra lemon juice, salt, pepper, extra virgin olive oil to taste. If you have some fresh basil leaves lying around and, like me, you've bought a cheap pesto, then chuck the fresh basil leaves in to give it a boost. Pour the dressing into the pasta and stir gently to coat the pasta evenly in the dressing. Divide the salad between four serving bowls or containers. 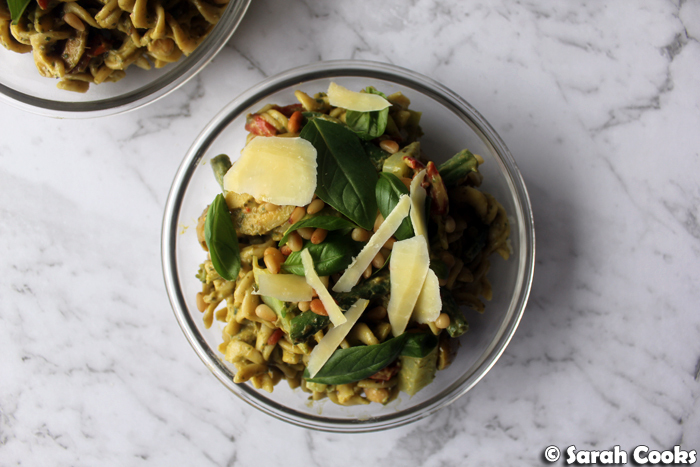 Sprinkle with the remaining pine nuts, fresh basil leaves and parmesan cheese shavings to serve.